Are you ready for the unexpected? Disaster, car trouble, whatever — they are all good reasons to be prepared. Here’s how to create an emergency kit. You never know when you might find yourself in an emergency situation. Storms, fires, earthquakes and floods — people around with the world deal with these disasters. Then there are smaller emergencies, like being stranded beside the road with a flat tire or struggling through a prolonged power outage. These dilemmas are often unpredictable, but you can prepare for them ahead of time, and one of the best ways to do that is to build an emergency kit of necessities: food, water, first aid and other survival gear. “Some people just want the basics and it gives them peace of mind and they hope they never have to use it, and other people are extreme preppers and have a year’s worth of food they want to stock,” said James Shea, co-owner of Essential Packs, a company in California that sells a wide variety of emergency kits and survival gear through their website emergencykits.com. Other companies that make and sell emergency kits include LifeSecure, Wise Company and Stealth Angel. But you needn’t order a kit to be prepared. You can also simply create your own. “I think half of what belongs in your kit is stuff you need to supply on your own — an extra pair of glasses, cash, documents, medication — that doesn’t come with a [premade] kit,” Shea said. Emergency kits should reflect the needs of the people who might use it. For example, if you have a baby in your family, your emergency kit should include diapers, formula and other supplies for caring for the baby. If you own a cat, your emergency kit should include cat food and a pet carrier. Emergency kits should also differ depending on the climate of the location and the types of disasters the person is more likely to deal with. For example, if you live in a place where wildfires are common, your kit may include a mask for keeping out smoke. If you live in a snowy place, you may add a collapsible shovel, hand warmers, ice scraper and a bag of sand to an emergency kit for your vehicle. Once you’ve created your emergency kit, you’ll want to store it in a place that is easily accessible and make sure all family members know where it is. Also, you will need to check the expiration dates on any food, bottled water and medications so you can replace these items when they expire. And you should check batteries to make sure they don’t go bad over time. Also, items like diapers should be switched out regularly to ensure the right size is kept on hand. The following is a list of emergency supplies for all situations, whether you’re building the kit to store in your home, your vehicle or at work. This list was compiled from information provided by American Red Cross and the Federal Emergency Management Agency. You’ll want to have one gallon per person, per day, for consumption and sanitation. American Red Cross suggests a three-day supply for on-the-go emergency kits, such as kits you’d use for an evacuation, and a two-week supply for home kits. Having a quick way to sanitize water may also prove useful, especially in long-term scenarios. There are multiple methods of sanitizing water, including iodine tablets, UV water purifiers and hand-pump filters. You can also boil water to purify it, though this takes time and fuel. Non-perishable food is a key component of any emergency kit. For three-day kits, this food can be as simple as a handful of energy bars, but for a long-term survival kit, you’ll likely want something with a little more variety and sustenance, such as dehydrated meals. And depending on who the kit is for, this food supply may also include baby formula and pet food. For longterm emergency kits, you’ll need a simple mess kit with bowls, a pot and utensils, as well as a small cook stove, to prepare dehydrated food. For a short-term kit (three day), this isn’t necessary. You can simply pack energy bars for food, which require no preparation. A flashlight or headlamp may be needed to navigate in the dark and signal rescuers. There are many different kinds of flashlights to choose from, including hand-crank flashlights, waterproof lights and solar powered lights. Do some research to find one that’s best for you. In an emergency, staying connected with the outside world can be important. 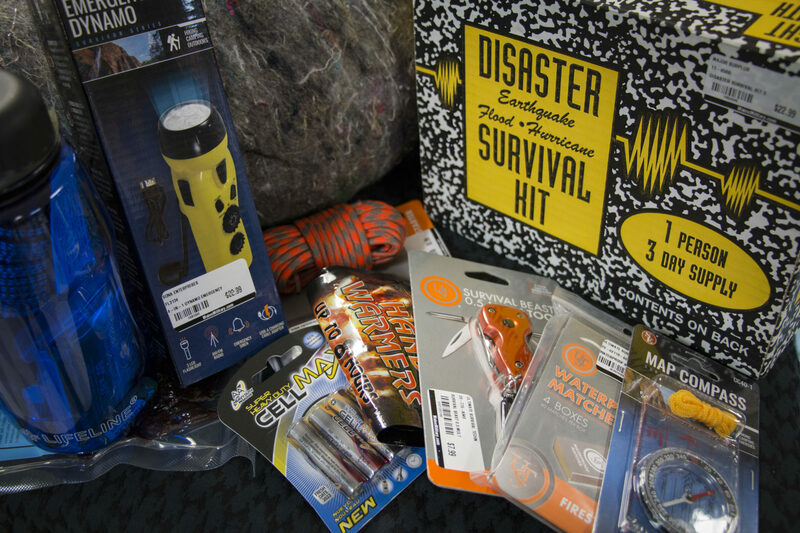 Therefore, most emergency kits should include a battery-powered or hand-crank radio, and more specifically, a NOAA Weather Radio, which is programed to multiple weather channels. Many of these types of radios also have other survival supplies incorporated into their designs, such as a light, compass, firestarter and whistle. Two-way radios and cell phones with chargers are also useful, as is a list of family and emergency contact information. And to catch the attention of rescuers, a whistle and flare gun are great ways to communicate. If some of your emergency supplies are battery powered, be sure to pack extra batteries. Portable phone chargers, solar chargers and crank-powered chargers could also be helpful. In case of injury, a first aid kit is extremely important. When you purchase a kit, look inside and check the contents. Depending on what’s included, you may want to add to it. A medical mask or dust mask may also be useful in situations with smoke or air particles. And American Red Cross suggests people pack a seven-day supply of any medication or medical supplies that they rely upon, such as prescription medications and diabetic supplies. Also, non-prescription medications such as pain relievers, allergy medication, antacids and laxatives may be useful. A multi-purpose tool, duct tape and paracord may come in handy when applying first aid, constructing a shelter and preparing food. A manual can opener is another useful tool, since many nonperishable foods are in cans. Being dirty can add unneeded stress to any emergency situation, and in some cases, it could affect your health in other ways, such as causing an infection. Hygiene items you may want to add to your kit are hand sanitizer, rubbing alcohol, soap, feminine hygiene items and, if you’re caring for a baby, diapers and diaper rash cream. Garbage bags are also useful. In a waterproof container or bag, store copies of personal documents such as medication lists, important medical information, proof of address, the deed or lease to your home, passports, birth certificates and insurance cards. Having a little extra cash could be useful in some situations, for example, when the electricity is out at stores. Basic shelter such as an emergency blanket can protect you against the elements and keep you warm. Sleeping bags, tents, tarps and other types of shelter are also good ideas, especially for backpack kits meant for evacuation. An inexpensive type of shelter can be made from plastic sheeting and duct tape. Finding your keys when in a rush can be difficult on a regular day, let alone during an emergency. Place extra car keys and house keys in your emergency kit. If you have a pet, you’ll want to pack extra supplies such as a bowl, food, extra water, leash, collar, carrier and a copy of the pet’s vaccination papers. Extra clothing, towels, rain gear or snow gear may be necessary, depending on the weather and climate of your location. A hat, work gloves and good shoes may also be useful, especially if you’re traveling by foot. For cooking, warmth and as a signal to rescuers, fire can be extremely important. Pack waterproof matches or a fire starter, as well as some material to help get the fire going, such as cotton balls coated with Vaseline (stored in a small plastic bag). While not crucial to survival, games, books or toys may be key to keeping up moral, especially if your group includes children.